The highly-anticipated UFC 228 on Saturday night has two championship rematches at the top of the bill. The main event has welterweight champion Tyron Woodley defending his title against Darren Till. The co-main event has Nicco Montano putting her women’s flyweight title on the line against Valentina Shevchenko. When MMA fans get two great fights like this, there are certainly plenty of bets to be made. Let’s take a look. Online sportsbook, sportsbookreview.com, (as of September 5) has Woodley vs. Till odds at pretty much even. Till comes in at -111, meaning you’d need to wager $111 to win $100 and Woodley is -119, meaning you would need to wager $119 to win $100. The over/under on how many rounds the main event will go is set at 4 1/2 with the the former originally coming in -125 and the latter at -105. 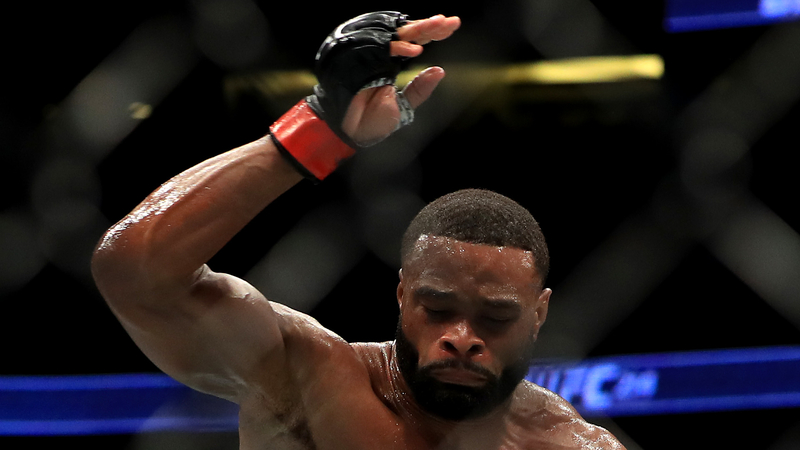 In his last two victories over Stephen Thompson and Demian Maia, Woodley (18-3-1) has taken the approach of seizing their greatest strengths and making them as uncomfortable as humanly possible. The greatest strength Till (17-0-1) possesses is his power with his left hand. Woodley will look to neutralize that by using his superior wrestling to make sure the England native doesn’t get the opportunity to do such. Till’s recent struggles with the scale will present a problem for his conditioning. Woodley will make sure the fight goes the distance by dragging the match into the later rounds to make Till suffer for spending all his energy in cutting weight instead of working on preventing the takedown. The Montano vs. Shevchenko odds have Montano as the biggest underdog for a UFC champion since Matt Serra went in as a +430 underdog when he faced Georges St-Pierre at UFC 83 in 2008. SportsBookReview.com (as of September 5) has Montano listed at a +928 underdog, meaning you would net $928 from a $100 wager. Shevchenko is a -2344 favorite, meaning you’d need to bet $2,344 to win $100. The over/under on how many rounds the fight will go is set at 3 1/2 with the former originally starting at -110 and the under coming in at -120. This fight comes down to experience. UFC 228 will be Shevchenko’s 79th fight in a combat sports career that began in 2003, while it will only be Montano’s seventh official bout since her she started in 2015. What Montano (4-2) has going for her is the unknown. People know Shevchenko is one of the most dangerous female strikers in the world and Montano hasn’t firmly established her favorite method of attack. Montano is a better fighter than people are giving her credit for. But to win, she’s is going to have to be the aggressor and make it an ugly fight inside the clinch. She needs to get the fight to the ground and either look to connect on ground-and-pound punches to win by TKO or try to either improve her position for a possible submission. Upsets do happen and the upside is too big to not place bets on Montano. Take out the Ben Franklin and take a chance on the champion. Former women’s strawweight title challenger Karolina Kowalkiewicz is a huge underdog (+296) when she faces another former 115-pound title challenger in Jessica Andrade (-403) according to sportsbookreview.com. The over/under for total rounds is 2 1/2 at -240 for the over and +190 for the under. Since losing to former champion Joanna Jędrzejczyk in a title fight and Claudia Gadelha in her next outing, Kowalkiewicz struggled, but has earned back-to-back victories against Jodie Esquibel and Felice Herrig, respectively. Andrade decisively beat Gadelha and Tecia Torres after losing to Jedrzejczyk at UFC 211. She’s also won five of her six fights since moving down to the women’s strawweight division in June 2016. Kowalkiewicz is due to return to the form which led to a 10-0 start to her career and a championship opportunity. You don’t begin your career like that without having any talent. She needs to keep the fight on the inside and use her clinch game because you don’t want Andrade to have any type of space, as she’s the most explosive fighter in the division. When she did that against Jedrzejczyk, it proved to be effective and gave her fits. Kowalkiewicz feels that if she’s unable to fight the way she wants than she will fight Andrade’s fight. That would prove to be effective as all you need is one counter punch to connect in the right spot and it would be all over. The odds are wide enough and we have seen enough from Kowalkiewicz to realize that it’s worth putting some money on her to spring the upset and inside the distance.